We know that there are a lot of people that often ask the question ‘What are the different coloured recycling bins for?’ so we thought that we would help provide a quick reference guide for you to better understand exactly what the Ecobin original range of coloured recycling bins are used for and hopefully make life a little easier for you. 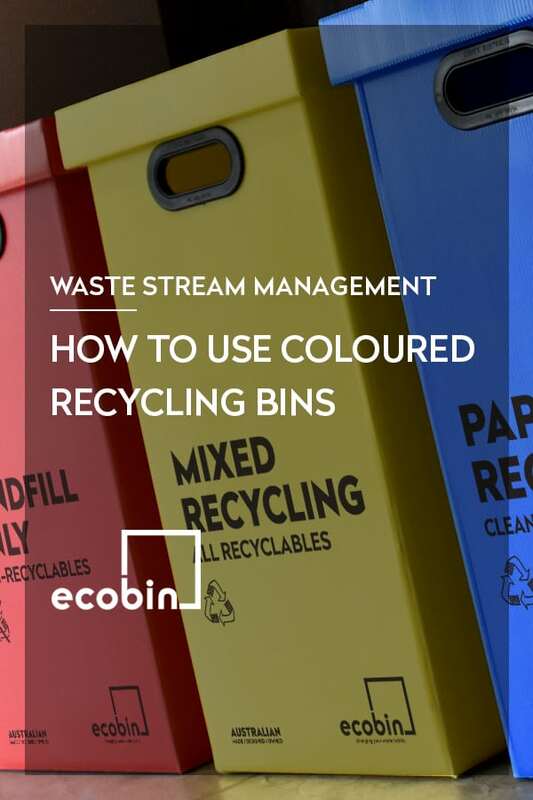 In our original Ecobin family we offer five coloured bins and they are all explained below for your convenience. Hello, and welcome to Paper & Cardboard recycling 101 which is pretty serious business as chopping down trees is KILLING OUR WILDLIFE AND ROBBING US OF OXYGEN, which I don’t know if everyone has forgotten, is a super-duper-mega vital part of our survival. Paper and cardboard are both made from cellulose fibres extracted from trees and in order for this extraction to occur, a tree must be cut down. That’s right, cut down. Right down, baby. Right down. This means one less tree to provide you and two other people with oxygen… for life! What can I put into the Blue Paper Recycling Bin? Due to the lack of oxygen in our landfills (because they’re stuffed to the brim), the organic waste undergoes a process called anaerobic decomposition and generates the Cobra Kai Sensei of gases called methane, which is 25 times more potent a greenhouse gas than carbon dioxide. Composting your apple cores, banana peels and your dad’s best attempt at a spag bowl starts with the correct disposal of your organic material – whether it be a composting unit, a specific bin, or a small caddy in your kitchen, it all starts with you in your home or office. What can I put into the Green Organic Recycling Bin? Alright – let’s get down to the nitty-gritty of Landfill, folks. They’re filling up faster than you can say ‘An Inconvenient Truth’ and that’s not even the worst part. With rotting fruit, pesticides and pharmaceuticals being discarded as general waste the air above is being poisoned with gases nastier than your farts (i.e. methane, ammonia etc) and our land below is being contaminated with chemicals from disinfectants and other cleaning products, potentially leading to our soil and groundwater. Queue that sinking feeling in your stomach now. Nobody stands around at a landfill site waiting around to sort through the garbo’s dump and dash. There’s no checking to see if any recyclables took the wrong exit and ended up in the wrong place. It is quite literally a dump onto the already mountainous piles and then covered with soil as if nothing ever happened. What can I put into the Red Landfill Bin? Co-Mingle Recycling, sounds delightful doesn’t? All the plastic takeaway containers and chickpea tins enjoying each other’s discarded company before they’re taken for initial processing. That’s how we like to imagine them in our Mixed Recycling bin anyway – living their best single-use life, waiting to be transformed into something EXCITING and COOL! Perhaps a backpack for a pre-schooler or a ritzy new outdoor setting. Bike parts, appliances, clothing, carpet, fiberglass – these are all things your mixed recyclables can become if recycled properly! What can I put into the Yellow Mixed Recycling Bin? Did you know soft plastics (bread bags, pasta bags etc) don’t mingle well with recyclables? It’s okay, not many people do. This is why we, at Ecobin HQ, felt we had to meet the need for the correct disposal of soft plastics. Disposing of the incorrect type of plastic can contaminate recycling, meaning it can’t be processed into a shiny new sustainable product and will most likely be sent to loathsome Landfill. These scrunchable plastics can also get caught in the sorting machinery at recycling centres causing messy breakdowns and delays worse than local trains, ultimately increasing the cost of recycling – definitely not what we want! What can I put into the White Soft Plastics Recycling Bin? What are the different coloured recycling bins for?